April 18th, 2016 – VMI completes its ACE family with the VMI ACE 600. This latest addition to the ACE range of products has an unrivalled capacity of 60 bags per minute. 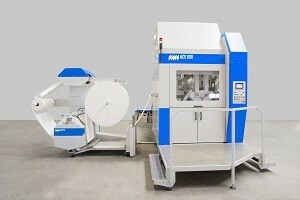 The ACE 600 enables high quality production and packaging of cotton pads at speeds unseen in the industry. The ACE 600 includes a higher number of punch dies and aims at increasing the overall capacity of the non-woven cotton pad production. Processing a web width of 600 mm, it can punch and pack up to 60 bags of cotton pads per minute. The system is capable of producing pads of different sizes in small and large bags. All with just one person operating two ACE 600 units, this results in more profit per bag. The complete ACE range allows for fully automatic transformation of rolls of cotton blankets into a neatly bagged product, ready for sale. It is characterized by low maintenance and does not require a special foundation. The machines are designed for low consumption of power and compressed air, keeping operational costs as low as possible. Next to the cotton pad punching machines, the range of equipment also includes an automatic Joiner and Profiler for a highly efficient production and packaging of cotton pads. More information can be found at: www.vmi-care.com. People feel a real pride when they create technical innovations that keep manufacturers ahead in their markets. That’s the passion behind the VMI Group and our work with tires, rubber, cans and care products. VMI is a wholly owned subsidiary of TKH Group N.V. (NYSE Euronext Amsterdam, www.tkhgroup.com). VMI is the world’s leading producer of tire manufacturing machinery, and offers global technical support from service centers in The Netherlands, Germany, Poland, USA, Brazil, China, Malaysia and Russia. VMI employs more than 1200 people around the world. To learn more about VMI Group, please visit www.vmi-group.com.